Let the enriching blend of cedarwood, vanilla, basil and cinnamon fill your room with this luxurious home perfume diffuser. 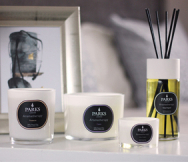 We carefully select all natural essential oils for our diffusers, which combine to create a unique scent which not only smells aromatic, but influences the ambiance and energy within your home. The scents we have chosen for our Enriching diffuser will elevate, fulfil and inspire you. When used in aromatherapy, the woody, earthy scent of cedarwood essential oil is known for its soothing and calming effect on the mind, as it helps to relieve tension and anxiety. It can also help enrich the quality of your sleep, making it the perfect scent to perfume the bedroom or any other relaxing space. The powerful, sweet aroma of vanilla has soothing and relaxing properties, and is an effective antidepressant. Basil can be used to combat stress, mental fatigue and nervous tension due to its refreshing scent. Basil essential oil is widely used in aromatherapy due to its calming nature. Perfume your home with the aroma of basil to enrich the mind. Earthy, spicy and sweet, cinnamon aids brain function and helps to ease nervous tension. Cinnamon can be used as an emotional stimulant, as the scent helps to reduce drowsiness and irritability. It has been found to help improve concentration and performance, the perfect scent to stimulate productivity.